Northern Rocky Mountain wolves, a subspecies of the gray wolf (Canis lupus), were native to Yellowstone when the park was established in 1872. Predator control was practiced there in the late 1800s and early 1900s. Between 1914 and 1926, at least 136 wolves were killed in the park; by the 1940s, wolf packs were rarely reported. By the 1970s, scientists found no evidence of a wolf population in Yellowstone. 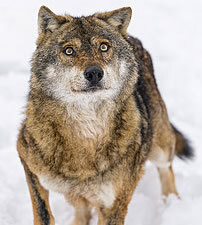 In the early 1980s, wolves began to reestablish themselves in northern Montana; an estimated 75 wolves inhabited Montana in 1996. At the same time, wolf reports were increasing in central and north-central Idaho, and wolves were occasionally reported in the state of Washington. Still, no wolves were reported in the Yellowstone Park, though there were some advocates for restoring their population there. The U.S. Fish & Wildlife Service 1987 Northern Rocky Mountain Wolf Recovery Plan proposed reintroduction of an "experimental population" of wolves into Yellowstone. In a report to Congress, scientists from the University of Wyoming predicted reductions of elk, bison, moose, and mule deer could result from wolf restoration in Yellowstone. In October 1991, Congress provided funds to the U.S Fish & Wildlife Service (USFWS) to prepare an Environmental Impact Statement (EIS) on restoring wolves to Yellowstone and central Idaho. After several years and a near-record number of public comments, the Secretary of Interior signed the Record of Decision on the Final Environmental Impact Statement (FEIS) for reintroduction of gray wolves to both areas. Staff from Yellowstone, the USFWS, and participating states prepared to implement wolf restoration. 1. Read the first paragraph, somewhere there (or possibly in the 2nd paragraph) should be a BIG IDEA about what the article is going to be about, this shouldn't be more than a phrase or a sentence. In composition class, this is probably called the author's thesis. Underline or highlight the thesis statement and annotate it with "THESIS"
3. Connect related ideas by drawing arrows from one idea to another, annotate those arrows with a phrase about how they are connected. 4. If you encounter an idea, word, or phrase you don't understand, circle it and put a question mark (?) in the margin that indicates an area of confusion, write the question in the margin. 5. Anytime the author makes a statement that you can connect with on a PERSONAL level, annotate in the margins a summary of how this connects to you. 6. Place a box around any term or phrase that emphasizes scientific language. These could be words you are not familiar with, define those words in the margins.